On Tuesday night, I went out to dinner with my friend C to celebrate his birthday. I suggested a restaurant that I've been wanting to try for months, Vivo Trattoria & Wine Bar, located in nearby Hanover, Maryland. I believe I discovered it on Yelp where it has rave reviews. It was so nice. First, I love an independently-owned establishment. I also adored the decor and ambiance, with stone walls, an open kitchen, brick oven, and candlelight. I even liked the classic white napkins with red stripes. There was outdoor seating but thunderstorms were in the forecast that evening so we didn't want to chance it. The area is new development with a hotel, parking garage, and other eateries. I love dining al fresco. Next time. I ordered a quartino of Chianti which is a glass and a half, the perfect amount for me. We were served good bread and oil while waiting for our food. For my entree, even though I love pasta, I opted for pizza instead. I was so happy that I did because it was delicious. 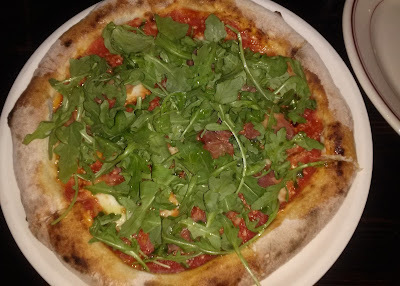 The Prosciutto & Arugula Pizza reminded me of the pizza topped with fresh ingredients I enjoyed whenever I visited Italy. You could taste that it was cooked in a brick oven. I ate the entire thing, savoring every bite. I can hardly wait to go back for another wonderful dining experience and to try a pasta dish! And maybe sample some salumi before the main course? Or I'll ask for the dessert menu! This restaurant will be among my 'top five' in my general area. I had a good time dining out. I dressed up alittle for the occasion, wearing a new black casual cotton dress, metallic flat sandals, simple jewelry, and carrying a black leather clutch. He seemed pleased with the birthday gift I gave him, a book that reflected an interest of his. It was nice to do something fun in the middle of a long week.